I’ve painted some very intricate murals, but sometimes a simple silhouette mural is exactly what’s called for. 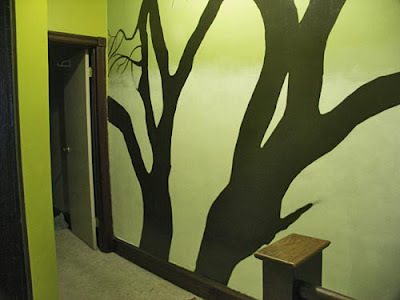 In this case, less is more for a hallway that is dark with no direct light and only a single bulb light fixture. It’s also quite narrow – only 3 feet wide in the area in front of the bedroom door and flaring out to 5 feet as nears the stair railing. If it were wider I’d say to hang artwork, but since it’s that narrow, any paintings hung there would frequently get knocked into. 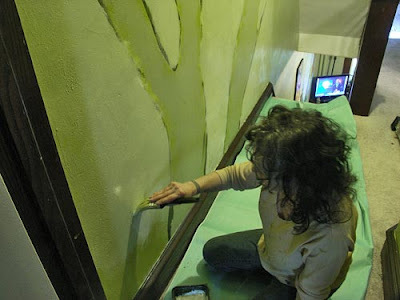 That’s why a mural works so well. I’m using only 2 colors – white and a dark brown that’s similar to the door frame and the base boards. Below is the “before” photograph. To begin the process, I measured the wall’s size – roughly 9 feet high by 11 feet wide. I needed a blueprint to work from so I found a tree shape I liked and then in Photoshop, I desaturated and darkened it to create the silhouette. Again in Photoshop, I created a document that was 9 inches high and 11 inches wide in order to give me the same dimensions of my wall. I made the background color graduated from green to white and also made a triangular slice in the upper right corner where the stairway to the attic cuts in. I then placed my tree silhouette into a layer in this document. Finally, I put a red grid over it, with the lines placed in 1″ increments. This is important for when I draw the tree onto the wall. Now to place a grid on my wall. I use a 4-foot long level and start in the upper corner. I make sure to rely on the level to keep things even, as ceilings and floors are often not. I’ll make marks every foot both horizontally and vertically. 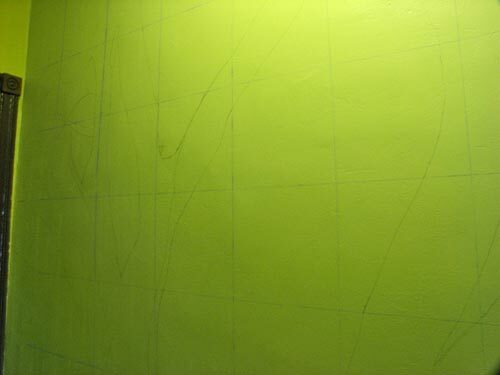 I’m connecting my marks together to form my grid using my trusty old chalk line reel. It’s easiest to do this using two people, but it’s also possible to do it solo. To do it by yourself, simply use a push pin or small nail to hook the line onto, as shown below. Once you’ve got one end secured with the nail, stretch the line tight and lock the reel so it doesn’t release any more cord. Hold the cord on the mark you made on the wall and with your other arm, reach out and snap the line. This will leave the chalk mark on the wall. Keep doing this and you will have your grid. Due to the sloping attic stairs which you can see behind me in the photo below, I couldn’t take the grid all the way across, but I knew I could “eye ball” the drawing past that point. Below is what the chalk grid lines look like. You can also see the texture of the wall. This is an old house, so it has REAL plaster walls, not drywall, so there is a lot of texture here. 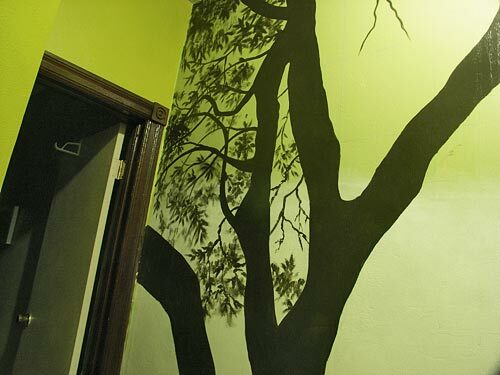 The next step is to transfer the tree design onto the wall. Here’s where the grid comes into play. This is a technique that artists have used for centuries. 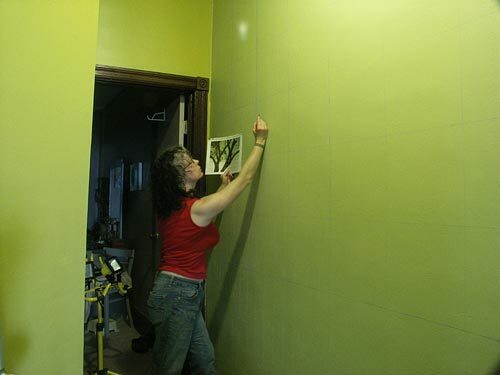 Basically, you draw – square by square – what you see on the paper onto the wall. This is why it’s so important for the two grids to have the same dimensions and the same number of squares in the grid. 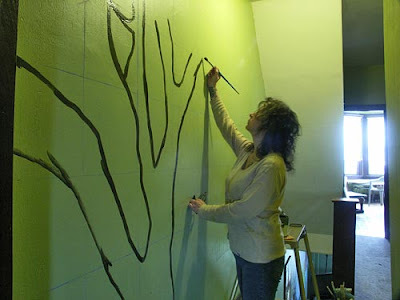 To do the drawing, judge the position of the outlines and shapes of the tree. It’s helpful to stop thinking about the form being a tree and to think about it as a series of lines, shapes, positive and negative spaces. 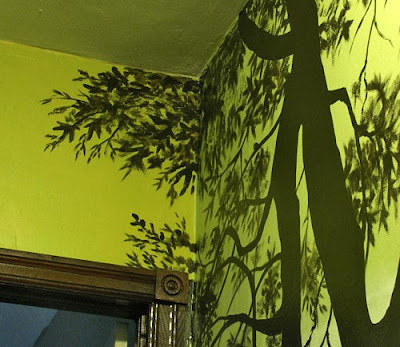 I drew in only the trunks and the large limbs – no leaves or smaller branches. The pencil marks are visible but not real dark – just enough for me to see. 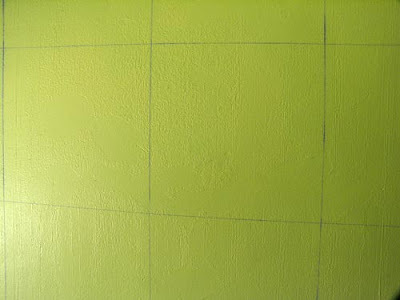 After the line drawing is up, I outline with the dark brown latex paint. Once the tree is totally outlined, I then start filling in the top section of the tree. At this point I’m only filling in about half way down the tree. 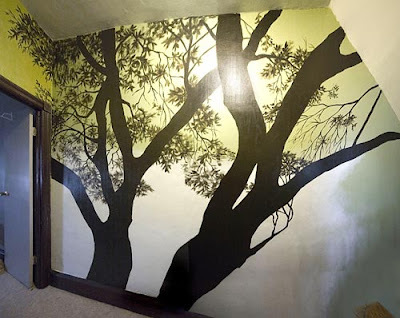 You might think it’s easy to just fill in a silhouette form, but it can be tricky as you could easily find yourself painting in an area that’s supposed to remain unpainted. It’s important to pay close attention to the positive and negative areas of the design – and never rush! Once the paint is dry, I use a towel to rub off the chalk grid lines. Then I start painting in the white at the bottom half of the design. I could have painted in the white before I even drew in my grid, but I wanted to get the outlined trees in first so I could see the overall layout in order to decide just how far up I wanted this white area to go. 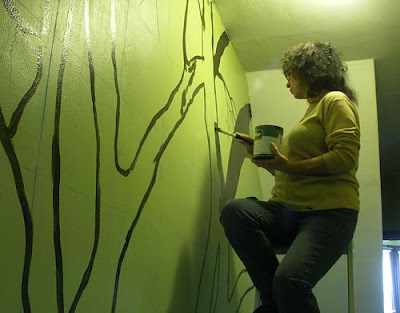 Below is how the wall looks with the white paint and the dark upper limbs. I let the white paint dry and then do a second coat. And here it is with the second coat of white and with limbs and trunks fully painted in. Next I start painting in the leaves and smaller branches. I start in the upper left corner and basically ignore the original blueprint at this point and lay in the leaves wherever I like. I should note that through the entire process I step back quite frequently to view how the artwork is looking as a whole. Stepping back is even more important now that the leaves are going in. 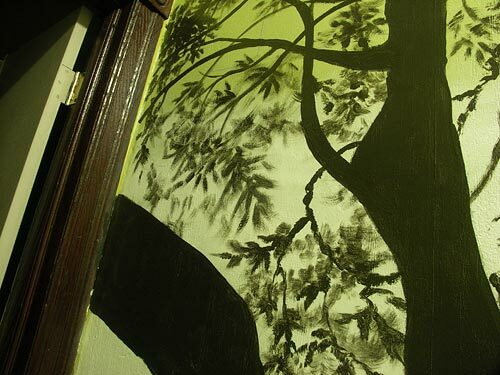 Here’s a closer view to give you an idea how I did the leaves. I roughed in clumps of leaves using a dry brush effect. 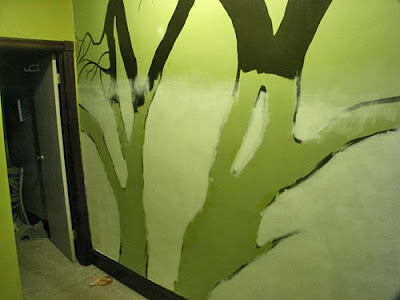 Then I paint a few leaves in with more defined shapes. After getting all the leaves and smaller branches painted in, I decided to extend the design onto the adjacent wall above the bedroom door. That’s an example of how important stepping back is – you get to see if a change would make the artwork better. I only extend the white area so far out because the steps leading downstairs are right there. So I feathered the white area out for a softened edge effect. 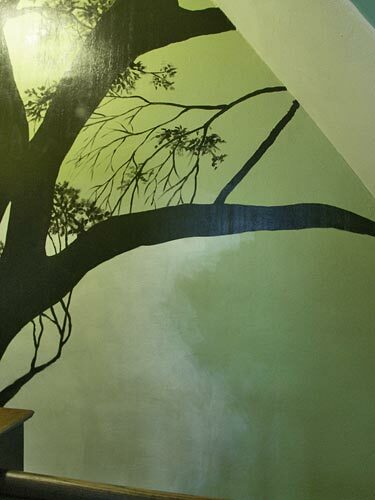 And here is the final outcome of my 2-color mural (3 colors if you count the background that was already there). Because of the extremely tight quarters, I couldn’t get a really great photo even using my super wide angle lens, but the image below approximates how it looks as you’re standing in my hallway.